Whether you call it a ball, a žoga, or a pêl, kids around the world are kicking, throwing or catching it. Students of all ages and levels may learn better if you link education to something physical and familiar. For entry-level students, the first step is to put new words to familiar objects and actions. 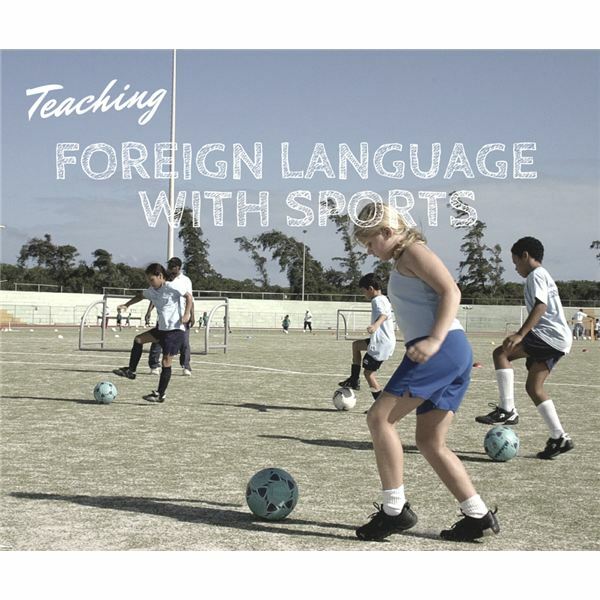 Present translations of ball, kick, run, catch, goal and other common terms to your students. Bring the items into the classroom, if possible, or use pictures and label everything. Point to each object routinely until the class has it nailed. Add new items periodically and invite students to find their own. Emphasize fun and unusual vocabulary. One of my favorites is cabezazo, which is Spanish for a header in soccer. Move on to sports sayings and clichés such as Attaque au Fer, which means to attack the opponent’s blade in fencing. Begin putting nouns and verbs together in basic sentences. “I kick the ball." Then change verb, subject or object. “I catch the ball." “I kick the bottle." “He kicks the ball." Next, add some adjectives and extra phrases. “I kick the white ball toward the goal." Switch the tense. “I kicked the ball." “I will kick the ball." Before long, you’ll be able to show a picture or video to your students. They will describe the action with a basic sentence. Challenge each student to create the most complete description. Have your students write conversations regarding their favorite sports. Use prompts such as, “How was your game yesterday?" or “Why do you like soccer?" One can be a reporter and another can be an athlete. They can construct a Q&A. Our shrinking world gives students an opportunity to converse with foreign students. You want to learn their language and they want to learn English. Search for “Language Exchange" to find numerous sites linking interested students. Include your favorite sport as a common thread and you can soon be video-conferencing about basketball with an Argentinian or soccer with a Slovenian. Some learners are more auditory and others are more visual. For those that learn better by reading, perhaps an email pen pal would be better than face-to-face video. With some nurturing, your class or school can create long-term international bonds that are mutually beneficial. After watching sports broadcasts on TV, many students dream of being sports reporters. You can give them that chance. Provide the box score and recap of an international match and then have them write an article on it. Get the cameras out and let them record their report. They will have fun when it goes right and they’ll have fun with the bloopers, as well. Bring in a recorded game and have your advanced students do a play-by-play. Even in your native language, it is harder than it looks. Your class will have a blast playing TV reporter for a day. Some sports spread around the globe well. Others, not so much. Not many people outside North America will join you in an American football conversation. Football with the round ball will get people talking from Armenia to Zimbabwe. Soccer – a great conversation topic worldwide. Baseball – very popular in Asia and Latin America. Basketball – growing in popularity across Europe, South America and Asia. Cricket – commonly played in ex-British colonies including India, the Caribbean and parts of Africa. Track and Field – popular worldwide, particularly during the Summer Olympics. Skiing – good for conversation with most European nations. Martial Arts – specific martial arts tie closely with national identity and language. Tae Kwon Do, in particular, always includes Korean language vocabulary.